Whether you are transferring food from the stove to a plate or eating in front of the television, you probably drop a lot more crumbs and debris on the floor than you realize. 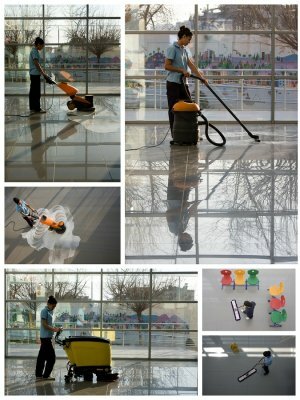 If you hire a professional maid cleaning service to come to your home, they can pay special attention to the floors so they can get rid of all of the crumbs and debris that could be marring your floors. This also helps you avoid problems with ants and other bugs that might be attracted to the crumbs. If you wear shoes as you walk across the floor, you might be creating some tracks that you do not even realize are there. Organizing regular housekeeping services for your home is an easy way to get rid of these shoe tracks before they start to take away from the aesthetic appeal of your floors. Mud is easy to bring into the home and hard to clean . If you utilize house-cleaning services in Ann Arbor, Novi, Detroit, or the Detroit metro area, you can be sure that your floors are clean and mud-free. You can place mats near all doorways to reduce the risk of tracking in more mud in between cleaning appointments. Dust mites, dander, and other allergens might be coating your floors without your knowledge. If you hire regular cleaning services, you can get rid of these allergens and improve the indoor air quality of your home and reduce your risk for allergies. It can be worrisome to allow strangers into your home, even when they are professionals from a hired company. That is why it is important to find a company you trust with employees that make you feel confident. Maid Aide works hard to provide the very best services combined with true professionalism! Our home and office cleaners are fully bonded and insured, making it easy to feel safe and comfortable when we come to your home or office. Other cleaning services have low standards when it comes to hiring employees, but we only hire employees that we would feel comfortable bringing into our own homes! When you request cleaning services from Maid Aide, you will know that your cleaners will arrive on time and provide high quality results. Whether you are looking for residential or commercial cleaners in Detroit, you will find the services you need from the professionals at Maid Aide! Our team can help you with regular chores or move in and move out cleaning services.